One Direction have been left looking blue - despite scoring their first number one. The five-piece act were not auditioning for the next Smurfs movie, but simply splattered and smeared with paint in a video for fans. The group made the messy film to create what is claimed to be the first ever "fan phone", which will be dedicated to the X Factor finalists. Their screaming army of devotees can order the limited edition Nokia handsets containing One Direction ringtones, wallpapers, interviews and videos. The group's Liam Payne said: "Our fans are always on their phones, so we thought this would be a great thing to do. It's the first time fans have had a chance to have a phone customised by their favourite band." 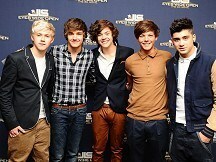 One Direction went to number one with debut single What Makes You Beautiful. The special Nokia C3 and C202 handsets go on sale at Carphone Warehouse from October 4.